Are we too late? Cause there is still a Liebster Award we would like to share! Our blog www.ginatha.com has received a Liebster Award from Stay a minute! The idea is brilliant. 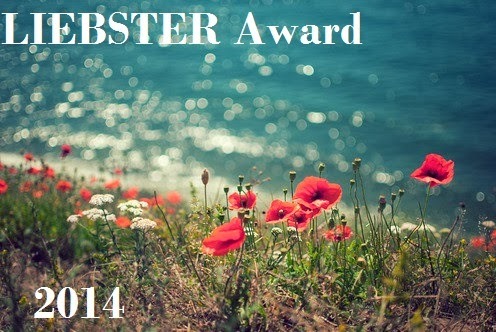 The Liebster Award helps bloggers to get discovered by other bloggers. 1. If you could meet anyone (deceased or living) who would it be and why? Anne Frank... She was so inspiring to me when I was her age! 2. Who is your idol/hero? Wow, never thought about that! Myself? Mwuhaha. No really, I don't know. I seriously want to be myself. 3. If you could live anywhere in the world where would you live? China. I would never get bored. I'd go out and watch temples and read their history all day. Plus... Chau Mi! 4. Why did you begin blogging and who was your inspiration? I didn't even know anything about blogging when I started! I thought Chantal and I were one of the only bloggers, haha. But we started, cause we wanted to amuse others and promote ourselves as actresses. 5. If you could spend a day with a blogger who would it be? I think that would be Jaimey from Stay a minute ! 6. Who is your go to style icon? These questions are hard! Hahaha. I don't think I have one, hmm. I get inspired by everything I see. People following their dream and won't give up even when others tell them to. If they can make it, I can do it too. 8. What is your favorite time of year? 9. If you had a second chance of one thing, what would you do over? School.. I chose the wrong education which wasted 5 years of my life. 10. If you had an unimaginable amount of money, which charity or non-profit organization would you donate to? None. I would pack my stuff, travel to wherever they need help and give it myself. I don't trust organizations. What's the craziest thing you haven't done yet but is still on your wishlist? What's the craziest thing you have done? If you could choose which era you could live in, which era would it be? If you could choose which language would be your first language, which language would it be? What's your favorite hair color? Have fun answering these questions and we would like to thank Jaimey for the Liebster Award and questions she made up! These questions were difficult, but really good actually! Thank you so much Ginatha! !